A black SUV flipped over at Erin Mills Pkwy. and Britannia Rd. on Friday, Aug. 5, 2016. A woman was arrested at the scene. A woman is in custody for allegedly driving while drunk at 8 a.m. in the Meadowvale area Friday. 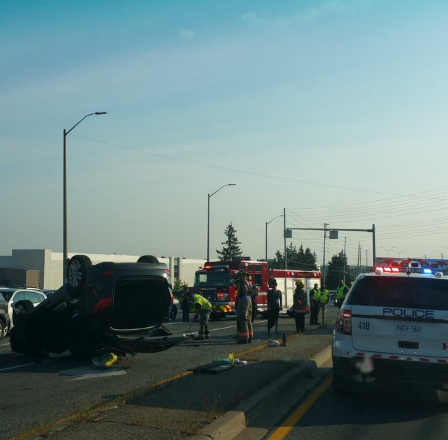 “A black SUV had flipped over” when emergency crews were sent to Erin Mills Pkwy. and Britannia Rd., said Peel Police Const. Rachel Gibbs. The driver was taken into custody for impaired driving. This marks another case of daytime drinking in Mississauga — a woman recently blew four times the legal limit. Police are warning residents to be cautious of their alcohol intake and plan ahead if they plan to drink. After a night out, “it can take many hours for your blood alcohol concentration to get back to zero,” said Gibbs.